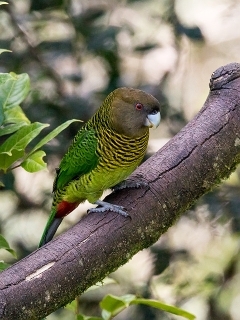 The Tiger parrots got their name because of their prominently barred plumage. P.b. brehmii: Male-dark brown head, tinted olive; sides of neck have yellow line; green upperparts, with black barring; green breast; red undertail coverts; green tail. Bill blue/grey tipped with white. Eye red. Female-yellow line down sides of neck absent; yellow breast, with black barring. P.b. intermixta: Both adults as in brehmii, but with more yellow underparts; paler olive/brown throat and sides of head. Larger in size. P.b. pallida: Male-plumage is variable, but as in brehmii, and more yellowish upperparts and underparts; abdomen has blue suffusion on some birds. Female-differs from brehmii by having yellow flanks and sides of abdomen with black barring; more yellow upperparts and underparts. P.b. harterti: Male-as in intermixta, but less yellow underparts; paler head with more olive colour. Smaller in size. Female-as in intermixta, but less yellow underparts; light black barring on flanks and sides of dull yellow abdomen. Smaller in size. P.b. brehmii: As in adult female but with orange/red undertail coverts, the feathers tipped yellow/green. Eye yellow/brown. Calls not often heard; when disturbed deep, short notes; also two-syllable harsh notes, some downslurred. Aviary 2.5 x 1 x 2m (8.2 x 3.3 x 6.5 ft). Pine and grass seeds, different fruits and berries possibly may be tried. Also vitamin and mineral supplements. P.b. brehmii: Vogelkop Mountains, W Irian Jaya. P.b. intermixta: Snow and Weyland Mountains and Mount Goliath, Irian Jaya. P.b. pallida: Mountains of Papua New Guinea, excluding Huon Peninsula, and east from Sepik River area. P.b. harterti: Mountains of Huon Peninsula, N Papua New Guinea. Diet includes seeds and berries from conifers and Podocarps. Slow-moving, short distance fliers. Found singly or in small groups and are fairly tame. Feeds on or near the ground although they are found at higher levels as well. Nestlings have been recorded in May and June.